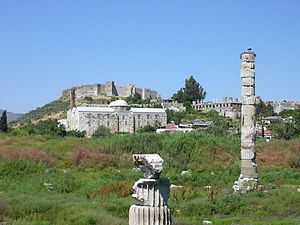 The site of the Temple of Artemis at Ephesus in Turkey. The Temple of Artemis (Greek: Ἀρτεμίσιον Artemision, Latin: Artemisium), also known as Temple of Diana, was a temple dedicated to Artemis (or Cynthia). It was completed around 350 BC at Ephesus (in present-day Turkey) under the Achaemenid dynasty of the Persian Empire. Only ruins remain of the temple. It was one of the Seven wonders of the World. Synthesizing Artemis of Ephesus: an 18th-century engraving of a Roman marble copy of a Greek replica of a lost Geometric period xoanon. The Temple of Artemis was near the ancient city of Ephesus, about 50 km south from the modern port city of İzmir, in Turkey. Most of the description of the Temple of Artemis comes from Pliny, though there are different accounts and the actual size varies. Pliny said the temple was 115 meters long and 55 meters wide. He said it was made almost completely of marble. It was about three times as big as the Parthenon by area. The Temple has 127 Ionic-styled columns. Each of them are 17.5 meters in height. The Temple of Artemis had many fine artworks. bronze sculptures by famous Greek sculptors Polyclitus, Pheidias, Cresilas, and Phradmon were in the temple. Paintings and gilded columns of gold and silver were also in it. The sculptors often competed at creating the best sculpture. Many of these sculptures were of Amazons, who are said to have founded the city of Ephesus. Pliny said that Scopas, who also worked on the Mausoleum of Mausollos, worked carved reliefs into the temple's columns. Athenagoras of Athens names Endoeus, a student of Daedalus, as the sculptor of the main statue of Artemis in Ephesus. The Temple of Artemis was at a flourishing region. It was used as a religious institute. Merchants and travellers came to it from all over Asia Minor. The temple was influenced by many beliefs. It can be seen as a symbol of faith for many different peoples. The Ephesians worshiped Cybele. They joined many of their beliefs into the worship of Artemis. Artemisian Cybele became very different from the Roman goddess Diana. The cult of Artemis attracted thousands of worshipers from far-off lands. They all gathered at the site and worshipped her. Anton Bammer, "A Peripteros" of the Geometric Period in the Artemision of Ephesus" Anatolian Studies 40 (1990), pp. 137–160. Lynn R. LiDonnici, "The Images of Artemis Ephesia and Greco-Roman Worship: A Reconsideration" The Harvard Theological Review 85.4 (October 1992), pp 389–415. This page was last changed on 6 May 2013, at 10:08.